How does it feel to travel the world and make films? Nathan Buck of City Video tells all in this article on making travel films. He’ll cover equipment considerations, due diligence and many other important points when embarking on travel filmmaking projects. Note: All photos in this article are Nathan’s. In early March, 2012 I was coming off a 14 hour flight from New York to Tokyo. As I landed, I knew that my wife and business partner, Megumi would be there to meet me as soon as I cleared customs. Ahead of us would be a whirlwind tour through Japan: we had been commissioned to make 20 three-minute travel films and we had 10 days to shoot in 6 cities, a national park, ski resort, several ancient temples, airports, train stations, factories, restaurants and ryokans (traditional Japanese inns). We would have to get our cameras on skis, boats, taxis, subway cars and the famous Shinkansen — the high speed Japanese bullet trains. 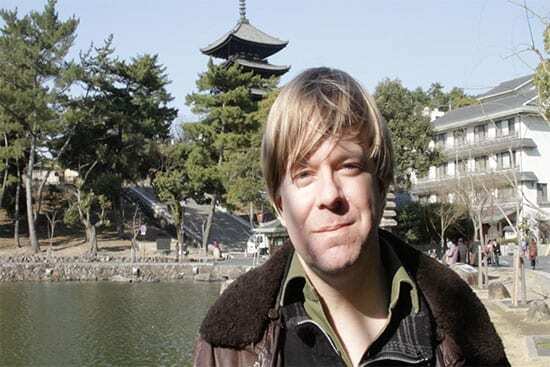 We would have to film discreetly in the most sacred sites in Japan, and we had to shoot everything, from close-ups of bowls of ramen noodles to panoramic vistas of the Alp-like mountains around Nagano. We needed steady, professional grade footage from places like Tokyo Disneyland, where tripods and monopods are banned. And we had to do all this on a shoestring budget with no special filming permissions or location releases. I had not slept well on the flight, but as soon as I met Megumi in the arrivals hall at Narita Airport we would need to start shooting. One of the films was about getting to and from the airports in Tokyo. This would be the only time we had to shoot at the airport, aside from our departure at the end of the journey. Megumi and I unpacked our camera equipment: a Canon 7D DSLR with a Zacuto viewfinder and stabilization rig and began shooting informational signs, ticket takers, entrances and exits. We stood at the taxi rank and filmed people getting in and out of taxis and boarding buses. As we stood on the quai waiting for our train ride into Tokyo, we shot as the train pulled into the station. And then hustled to get our equipment aboard and filmed from inside the train. We had a good idea of the images that we needed to collect from rough script outlines that we had written beforehand. Megumi had spent the previous 2 weeks organizing our trip for maximum efficiency and thrift. Our plan was simple: we would shoot during the day, and, whenever possible sleep as we traveled on buses and trains, thus saving money on hotels. Jet lag was to be ignored and within 2 hours of landing in Tokyo we had roughly enough b-roll for the first film, had stored our luggage for a few hours in a coin locker in Tokyo Station. From there, we found an Izakaya (a Japanese diner with sushi and beer), where we ate dinner. This also gave the opportunity to get off a few shots of the interior and a close-up of a delicious dish of Yakitori for later use in one of our eating in Tokyo videos. Then, we collected our luggage and boarded an overnight bus to Kyoto and then a train to nearby Nara, where we spent a day filming the oldest temples in Japan followed by a return to Kyoto that night. There, we continued filming in the traditional Ryokan where we slept in a traditional tatami room, woke up at dawn, had a copious home-cooked breakfast (always making sure to film the food first before eating! ), and walked to the Kiyomizu-dera. This was cool as we saw Buddhist monks making their morning ablutions and gathered the first footage of the many sites we would visit that day, as we made our way around Kyoto. We had decided to hire a taxi and driver for the day, which was a wise choice, as it allowed us to get around the city quickly and have a mobile base for our equipment and luggage, only taking with us what we needed at each stop. For the next 10 days, the schedule was punishing but exhilarating. Every connective moment, in hotels, transport, train stations was treated as an opportunity to shoot. This could be tiresome at times, but we found that shooting small details related to travel gave the films a sense of movement. 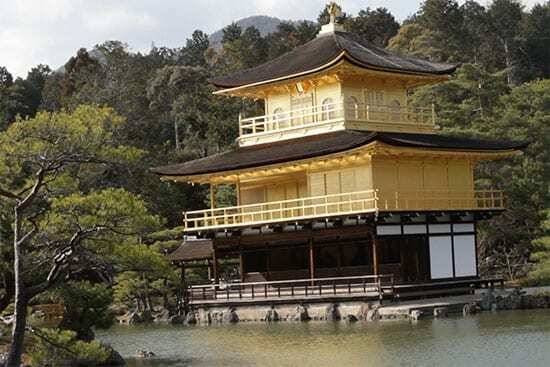 Later, as we edited, it was often these banal shots of daily life that made the “money shots” of the big tourist magnets like the Kinkaku-ji (the Golden Pavilion) in Kyoto, or the Daibutsu (Great Buddha) in Kamakura pay off. My producers at About.com liked what we had done in Japan and offered us a much larger 60 segment series to be shot all across Africa. We applied the same modus operandi, shooting in Morocco, Egypt, Kenya and South Africa. 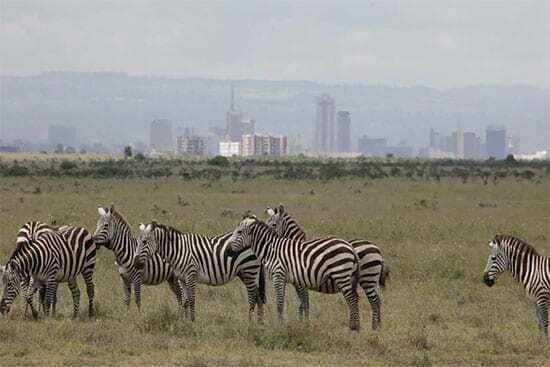 The films ranged from travelogues of major cities like Fes, Cairo, Nairobi and Cape Town, to general travel tips for Africa, to informational topics on subjects like wildlife and safari expeditions. For these kinds of films, we were able to cull footage from different phases of the trip. For example, combining safari trips in Maasai Maara and Nairobi National Park in Kenya with footage from Kruger National Park in South Africa. The safari footage was a highpoint of the trip for me. It was here more than any other part of the journey that I was grateful for the incredible technological leap that DSLR had enabled. Here, we were able to shoot from a camera platform on a mini-van with a 100-400mm lens. Which, when used on a 7D, gave an effective focal length of almost 700mm. On the safari trips in Kenya, we hired a driver on the minivan, which had a sunroof that we could poke the cameras through. 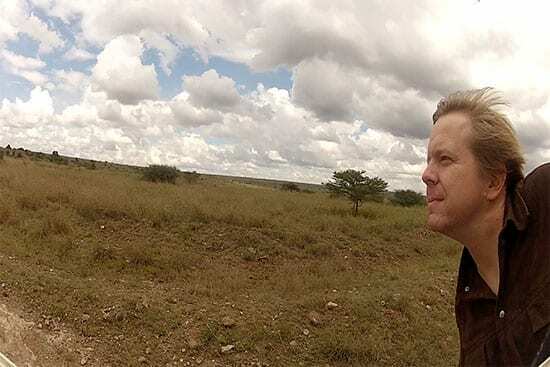 With the van parked and the camera stabilized on the monopod, we could grab amazing telephoto motion pictures of lions, cheetahs and rhinos that were a quarter mile away. Kruger is a remarkable park in that it allows self-drive with excellent paved roads. There were times when we could use our small vehicle as a dolly by driving slow enough to minimize camera shake. There were several lessons that we learned shooting travel films on what amounted to a discounted tourist budget. As soon as you start bulking up with harnesses, big tripods, matte boxes, microphones, etc, you will attract unwanted attention from police, security and site guardians. We had to cancel a shoot at the Pyramids in Giza (and return a few weeks later with much less stuff), because the officials wanted to see our shooting permits, which can be quite costly and require a side trip to the Ministry of Antiquities in Cairo. No one needs to know you are shooting video, and DSLRs can be passed off as being used for still photographs. Filmmakers like to wear their equipment as a mark of professional pride. But you want to go the opposite direction and look as much like a tourist as you can. To build on the previous point: small is beautiful. The more mobility and agility you have, the less weight you have to drag around and the more discreet you can be will work to your advantage when traveling and shooting. Always look for equipment that can deliver professional spec with a minimal footprint. And not to belabour the point, but: tripods are often prohibited in famous tourist sites and museums. They tend to be the single biggest giveaway that you are shooting professionally. When possible, use a monopod, and if even that is disallowed find other creative ways to stabilize your camera. Look for ledges, steps, vehicles or even a helpful friend’s shoulder as an alternative camera mount. I shot a film in the Louvre in Paris using this technique and was able to get excellent shots of famous paintings and sculptures without attracting the attention of the omnipresent docents. Keep in mind that most famous sites, monuments and museums are public property. There is no “copyright” on public property, so a location release is not required. However, municipal governments, museums, etc want to limit access to professionals because they want to be able to raise revenue from these national treasures with expensive shooting permits. This puts the onus of enforcement on the officials and staff at the site. Once the footage is recorded, it is yours. Your goal is to discreetly get the best possible footage you can. Later, when selling video on stock footage sites like Getty or Shutterstock, get images that are unique: for example a pigeon landing on a statue of Ramses the Great at Abu Simbel. 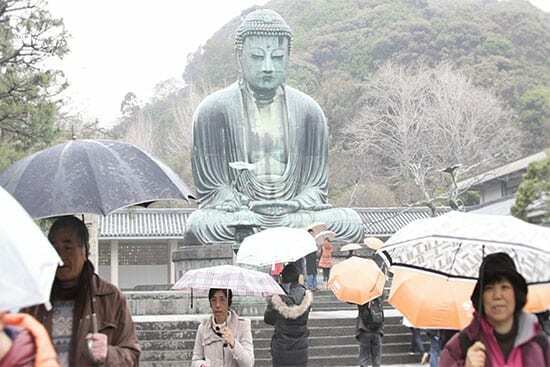 Or the Great Buddha in Kamakura on a rainy day when all the tourists have their umbrellas out. These will tend to sell better because they are unique and stand out in a crowded marketplace. There is an enormous opportunity now with the advent of 4K DSLRs. Over the next few years, the minimal resolution requirements from stock sites and video publishers will shift from 1080p to 4K and therefore old travel videos will need to be replaced. Slow-motion footage is another big opportunity. The increasing availability of inexpensive camera equipment that can shoot at high frame rates allows all sorts of possibilities that used to be inconceivable without big, expensive video and film cameras. A laptop, several pocket drives, plenty of batteries and a couple of chargers are essential. Traveling is stressful enough and often the last thing you want to do after an exhausting day of traveling and shooting is to spend another hour or two backing up and prepping. Without it though, you’ll lose a morning and you won’t get your shots. layer your filming objectives with your practical needs. 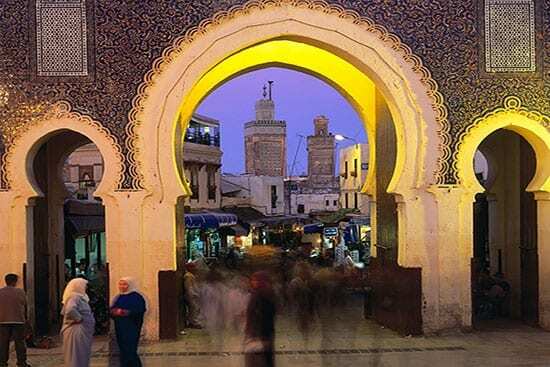 For example: we had to get from Marrakech to Tangier, which is an 8 hour train journey. We needed a lot of footage of the railway system for a film about Getting Around in Morocco and we needed to sleep. By booking an overnight train journey in a sleeper car, we were able to get where we needed to go, save money on a hotel, and get the bulk of our railway and train station footage. These are the kind of overlaps which you always want to try and find. You will meet wonderful, helpful people everywhere you go and learn about opportunities that you hadn’t thought of. Accessing good local knowledge is the edge that will give you footage that no one else has. So be prepared to throw out the plan when a better opportunity comes up. Again, this is about using what you actually have, which is invariably more interesting than whatever you thought you were going to get with a pre-written script. So there you have it. Making great travel films is not easy, but the results, and more importantly the experience, is incredibly rewarding. So have you made a film or video whilst travelling? Feel free to link it up in the comments below. Questions or thoughts about the article? As always, ask in the comments below. Inspired? Do you plan to make a film whilst travelling? Can this be done with just a standard DSLR camera or do you need pro gear?? Awesome stuff. Always like to read about travel filmmaking as its something I aspire to do myself in the future. Great site, continue the good work!